Eva’s Stone Cottage is covered in rocks from the nearby beach. ALTHOUGH CERTAINLY not obvious, the setting of the slender two-story home standing at the base of West Seattle’s Duwamish Head in our “Then” photo is repeated in Jean Sherrard’s “Now.” It is the red-and-gray modern residence held in a verdant caress just this side (to the east) of California Way Southwest. The home and the trees hide the boulevard, which is the long arterial connection between the top of Duwamish Head and the shoreline parks and mostly condominiums, respectively, to the east and west sides of Harbor Avenue. 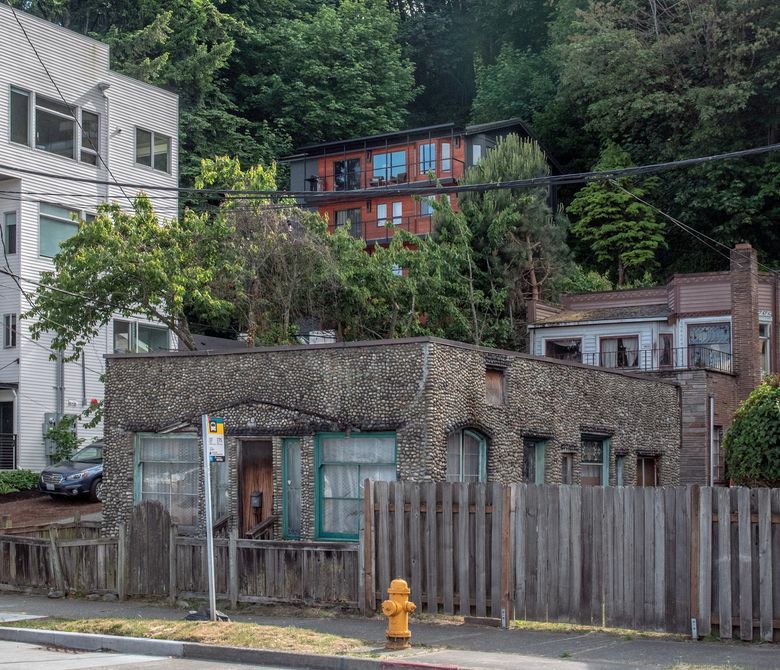 With Clay Eals, one of the most confident modern boosters of West Seattle, at his side, Jean aimed his Nikon southwest across Harbor Avenue to one of the Head’s best-known and most sentimental landmarks, Eva’s Stone Cottage. The framing of the beachside home with a marine view of Seattle was finished in the late 1920s. Asked by a granddaughter how she would like the house finished, Eva answered, “Well, what about putting little rocks from the beach on it?” With her family’s help, this prolific collecting, we suspect, continued into the Great Depression. Now Eva’s Stone Cottage is one of the few beachside homes surviving in the increasing crush of modern condos. After crossing Harbor Avenue, Jean and Clay continued around the corner of Eva’s home and climbed the length of what must be one of Seattle’s shortest streets, the half-block-long Maryland Place. In order to save room for Eva’s Stone Cottage at the corner, we have not included Jean’s more precisely recorded photo of our “Then” home at 4013 Maryland Place S.W. 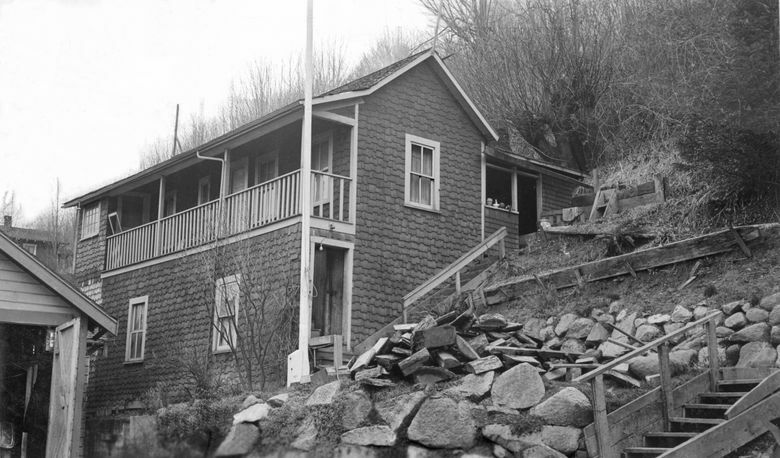 When completed at the cusp of the Great Depression, the cottage was topped with a waving cornice made from the darker rocks that the family carried home in a wheelbarrow. The tax photo attached to the card used here was recorded in 1937-38 during the Works Progress Administration’s photographic inventory of every taxable structure in King County. The assessed values for these two lots were $30 for the land and $230 for the home. Two years later, the home was visited by tragedy when 19-year-old John R. Lofstad was listed in The Times’ “Vital Statistics” feature as having died from an automobile accident.